The Micronutrient Initiative (MI) is the host of the Secretariat of the Micronutrient Forum which invites leading scientists, policy makers, and programmers across sectors to present their latest research and operational findings, and facilitates dialogue for all things related to the micronutrient industry. 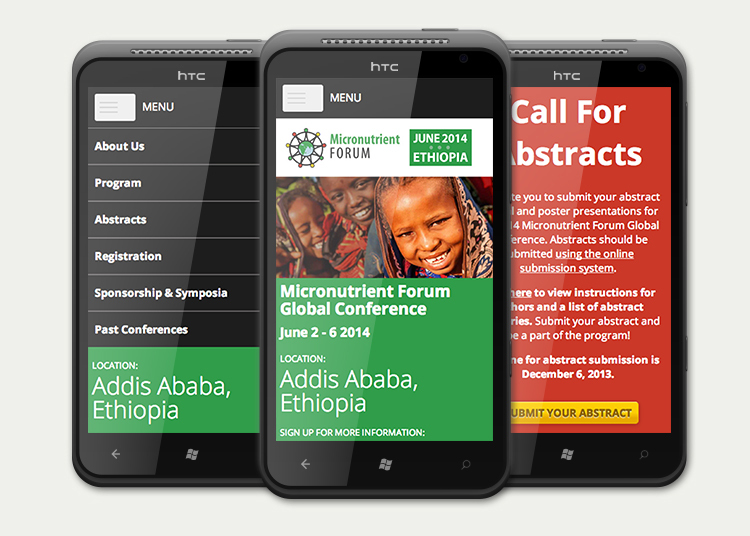 In mid-2013 MI contacted Industrial to create an event microsite for the Micronutrient Forum (MNF) that would meet short-term website goals in allowing attendees to submit abstracts and register for the conference in advance of the June 2014 MN Forum global meeting in Ethiopia. The microsite would also eventually lead to MI engaging Industrial to design and develop a full website at www.micronutrientforum.org to provide more information about the Forum year-round. With the guidance of the MNF Strategic Plan and in consultation with MNF staff, Industrial outlined a clean, user-friendly interface and a responsive design for the event microsite. This same approach would also flow through to the full site moving forward. Capitalizing on its scalable and flexible platform, Industrial implemented the Drupal Content Management System (CMS) on the site. Industrial chose the CMS for its extensive modules and broad customization features, which would allow MNF staff to quickly master updating and adding content without requiring advanced technical knowledge. Using a process-driven development approach allowed Industrial to quickly deliver the functionality required in the event microsite prior to the June 2014 event. Since launching the microsite, Industrial has continued work on an expanded website: defining an information architecture; building annotated wireframes; designing homepage and interior concepts; and defining functional specifications. Industrial was also able to implement SEO optimization tools, and provide CMS training and launch support to MNF staff. With the event microsite launched and the full Micronutrient Forum website still under development, Industrial continues to update content and provide maintenance support for MNF staff, and the full website is expected to launch early 2014. 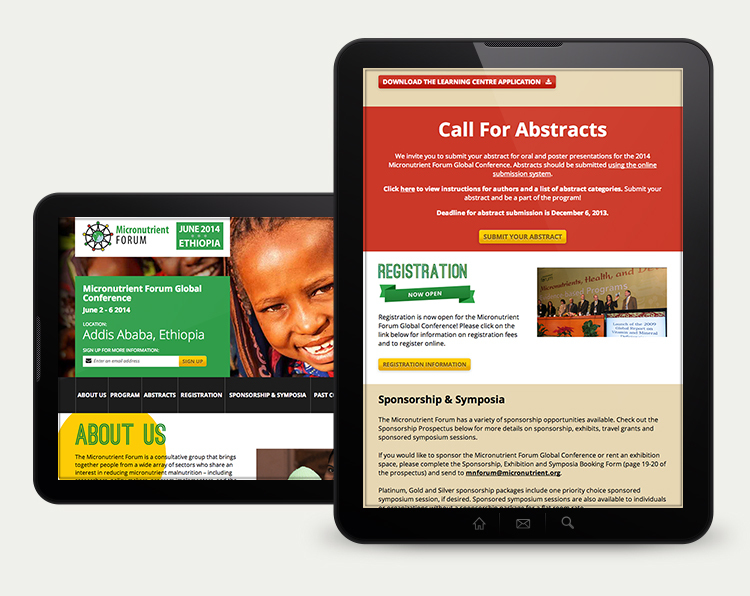 By working with the Micronutrient Initiative to identify short-term and long-term objectives for the MNF website, Industrial was able to create a sleek and functional event microsite in advance of the Forum, while also allowing MNF staff to develop the long-term vision for the full website. The most important factor in meeting these objectives came in involving all of the international stakeholders that the global MNF has, to ensure harmony and consistency in our end-goals and efforts. 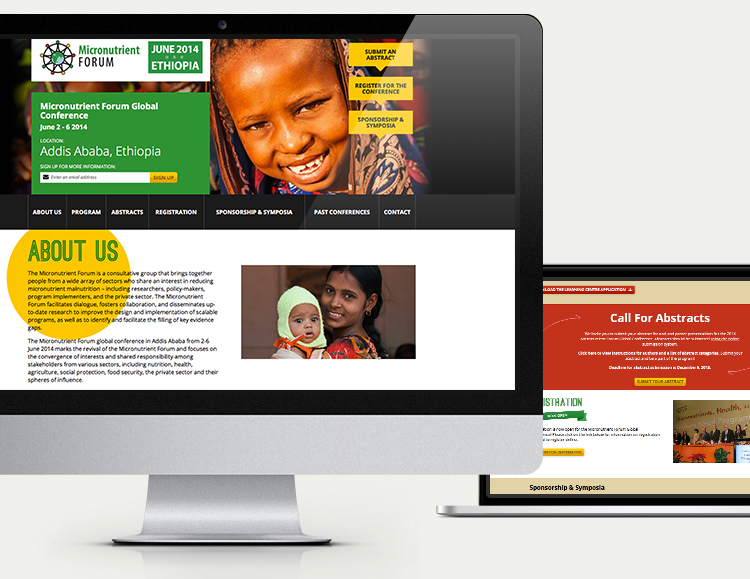 Throughout developing and shifting priorities, re-evaluating objectives and going back to the drawing board, a strong partnership between the Micronutrient Initiative and Industrial has been the driving force behind the site’s success to date, and the launch of a fully-extended website in early 2014.